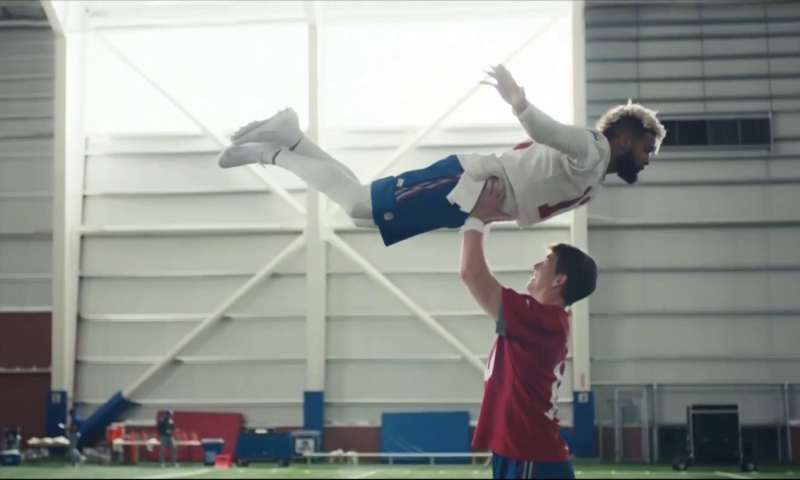 Well, Eli Manning and Odell Beckham won the contest of commercials during last night’s Super Bowl, a significant contribution to what was a good weekend for the NFC East. The Eagles won the championship by knocking off the heavily-favored Patriots in a delicious upset. The Redskins made headlines by seriously upgrading their QB position with Alex Smith. And, on a national scale, the Cowboys continue to be irrelevant. Does Jeffrey Lurie raising the Lombardi Trophy on national TV do anything for Jerry Jones? This is your division, Jerry Wayne. And you’re not even in the conversation. A Texas Longhorns football legend and the best two-way player Darrell Royal said he ever coached died yesterday. Tommy Nobis, a two-time All America and the only sophomore starter on the Longhorns’ 1963 National Championship team, passed away at 74. In my view, he is the greatest football player to ever wear the number 60, edging out contemporary linebacking cohort Chuck Bednarik. Nobis played both offensive guard and middle linebacker for the ‘Horns for three years, leading Texas to a 27-5 overall record and that national title. 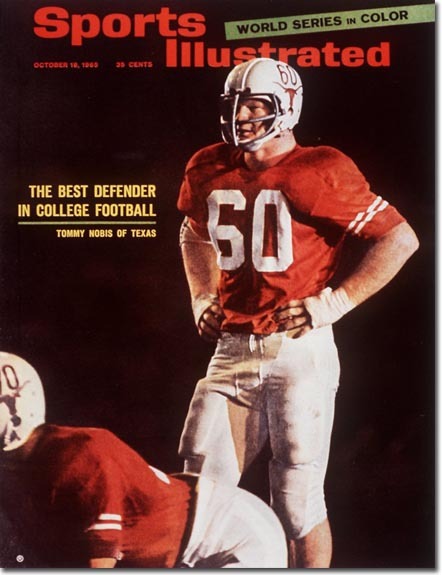 He was named All Southwest Conference twice, he was the team MVP twice, and in 1965 Nobis won the Maxwell Award as college football’s best all around player, the Outland Trophy as college football’s best lineman, and finished seventh in the Heisman vote. The expansion Atlanta Falcons made Nobis their overall number one pick in franchise history, outbidding the AFL’s Houston Oilers who also drafted him number one. And in that first NFL season, Nobis racked up an average of 21 tackles per game and won the league’s Rookie of the Year honors. He played in Atlanta for eleven years, leading the team in tackles for nine of those years, making the Pro Bowl in five of those seasons, and earning the nickname “Mr. Falcon.” From Thomas Jefferson High School in San Antonio to the College Football Hall of Fame and the cover of Life Magazine and the Falcons’ Ring of Honor, Tommy Nobis was the consistent picture of rich character, immense talent, and deep loyalty. God bless Tommy Nobis and his family. There’s a difference between advice and news. Advice is concerned about what you should do; news is a report about what’s already been done. Advice tells you to make something happen; news tells you something’s already happened and compels you to respond. Advice says it’s all up to you to act; news says someone else has already acted. 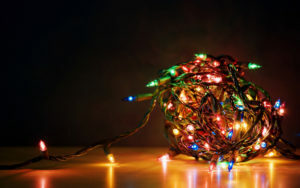 Something has happened, something has been done, and it totally changes everything. 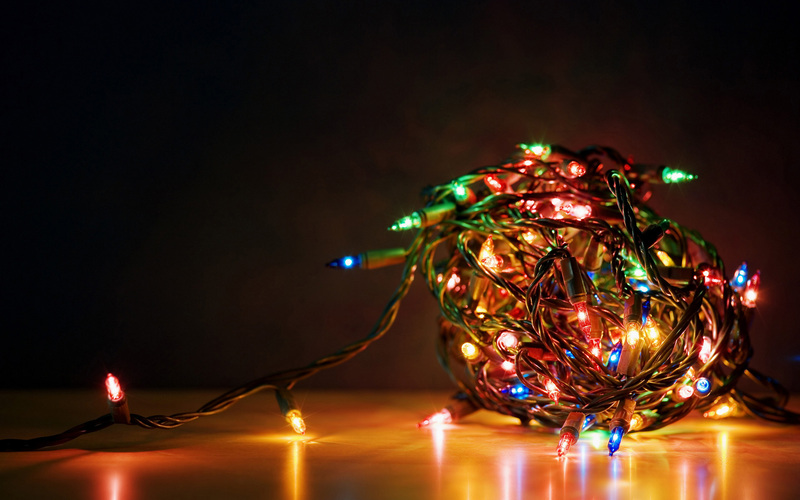 Glory to God in the highest, and on earth peace to all people! I feel really ripped off. Deprived. Done wrong. For the past four or five months we’ve been anticipating watching Tony Romo play football for another team and taking the analyzing and dissecting of his game and his psyche to a whole new level. When Houston unloaded Brock Osweiler a few weeks ago, the foregone conclusion was that Romo would be the Texans’ starting quarterback. They were clearing space for Romo. Denver was interested, but Houston was Romo’s destination. And maybe his destiny. How much fun would that be? I was already taking bets here in the church offices that whichever team Romo went to would finish 2017 with a better record than the Cowboys. 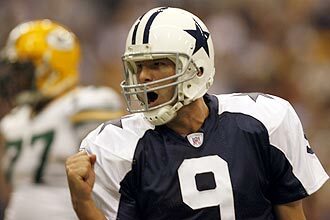 I was already gearing up to watch Romo, with the league’s best defense and some of the NFL’s best receivers and the best coaching he’s had in his career, win a divisional playoff game for the first time. I was licking my chops at the absolutely delicious prospect of Jerry Wayne’s adopted son winning a Super Bowl for another team. How awesome! But, no. I feel gypped. Cheated. Tony Romo has walked away from Houston and from the Broncos. The Texans are legitimately a decent quarterback away from competing for a championship; Denver is not too far behind. But Romo doesn’t want to give it a shot. Both those teams are legitimate contenders. Both those teams want Romo. But Romo doesn’t want to do it. He wants to go into broadcasting. I don’t blame him. It appears that Romo is smarter than I thought he was. It’s the right call for all the right reasons: personal health, a wife with a third child on the way, an unbelievable opportunity to immediately move into the top analyst spot at CBS. I get all that. It makes sense. But Romo has ripped us off again. He’s failed to deliver to our expectations. 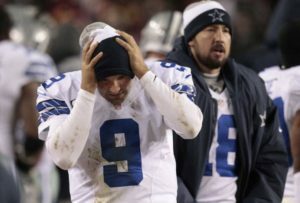 To be fair, Romo was trapped in the middle of the game of “chicken” between the Texans and Jerry Wayne. Houston was never going to give up a player or a draft pick to get Romo — the Cowboys don’t need Romo. 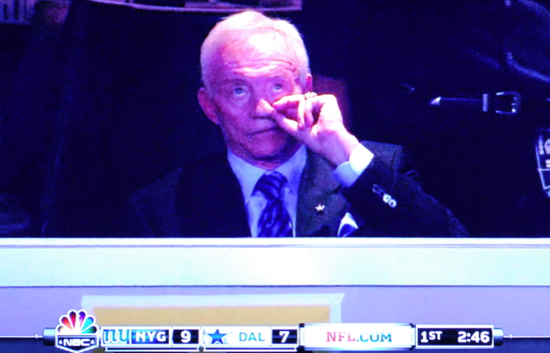 But Jerry was never going to give Romo away for nothing in return. While both sides dug in and refused to blink, while Romo was flapping in the breeze, CBS apparently backed a truckload of money onto Romo’s lawn and he couldn’t refuse. Jerry’s dream was to have Romo stay a Cowboy and be his incredibly overpaid backup quarterback to Dak Prescott. Unrealistic. Jerry’s worst nightmare was for Romo to go somewhere else — four hours south on I-45 — and actually win a Super Bowl! How delicious would that be?!!! Can you imagine!?! We’ll never know. Romo has walked away from the chance. His last act as a Cowboy was to disappoint all of us one more time. As for Houston, can they trade a number two draft pick to the Browns for Osweiler? This post is about the weekend election of Jerry Wayne into the once-proud Professional Football Hall of Fame. I’ll add a few observations from last night’s Super Bowl at the end. So Jerry Wayne is in the Hall of Fame. I need to take a shower. And brush my teeth. And gargle. Twice. Enshrining the Cowboys’ owner with the immortals in Canton values making money and turning a profit over winning football games and capturing championships. Jerry was elected solely on his ability to multiply cash. And it’s sickening. 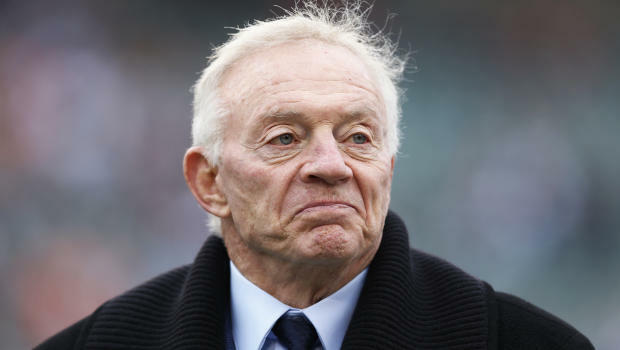 Give Jethro all the credit in the world for buying the Cowboys for 140-million dollars in 1989 and turning them into the world’s most valuable sports franchise at four-billion-plus-dollars today. But at the same time, recognize that Jerry has driven one of the NFL’s marquee franchises into a 21-years-and-counting streak of complete irrelevance on the field. Honor Jerry Wayne for sticking it to the networks and raising the annual revenue the league takes in on television contracts to 44.5-billion dollars. But, keep in mind that the Cowboys have not won a divisional round playoff game since Toy Story was released as Pixar’s very first full-length animated movie. Sure, praise Jerry for sticking with Pepsi and wearing Nike and going with Miller Lite and putting on Papa John’s pajamas to revolutionize the way the NFL does marketing agreements and stadium deals. But don’t forget that he fired Jimmy Johnson for winning back-to-back to Super Bowls and hired Barry Switzer. And Dave Campo. Yes, for more than two decades Jerry Wayne has made the NFL and all its team owners more money than they could have ever possibly dreamed. Jerry is a genius when it comes to making money. When it comes to stadium revenue, team marketing, club sponsorships, labor negotiations, and TV contracts, there’s no stopping Jerry Wayne. He’s going to win those games every time. At the expense of his team on the football field. Every time. The timing’s good for Jerry, huh? 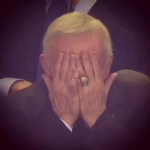 I wonder if Jerry had been eligible last year, when the Cowboys were 4-12, if he would have received the votes. What if his name didn’t appear on the ballot until next season when Dallas will be playing a bunch of division winners on its schedule instead of this year’s cellar dwellers? Would he still be elected? 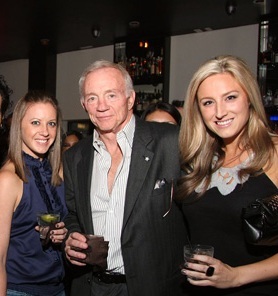 Jerry has demonstrated over and over that making money is a whole lot more important to him than winning championships. He proves it every year. He’s fond of saying that nobody ever really owns the Cowboys; one only takes care of them for a while before passing them on. When that day comes, the Cowboys will be richer in the bank than when he first took over, but in far worse shape on the field. The Hall of Fame inducted Tex Schramm and Tom Landry for building a dynastic team that posted 20-straight winning seasons, went to Super Bowls, won championships, and captured America’s heart with its dramatic performances of grace and power on the field. Now the Hall of Fame has inducted Jerry Wayne for making a whole lot of money for the NFL owners. The fact that he’s destroyed the on-field product in the process doesn’t seem to matter. All credit to Brady and Belichick and the Patriots’ D. Let’s recognize that coming from 25-points down to win the Super Bowl is a monumental achievement. Let’s acknowledge that holding the wild Falcons’ offense to zero points over the final nineteen minutes is an incredible accomplishment. But let’s never forget that Atlanta cost themselves the trophy. They gave it away. I don’t pretend to know all that happens on the field and on the sidelines, in and in-between the huddles, in the headsets, and player-to-player. I know it must all happen extremely fast. But coaches and quarterbacks do things all the time that make no sense. For example, at the end of the game-winning drive in overtime, after the pass interference in the end zone, on first and goal at the one yard line, why did Tom Brady throw a fade route to the corner? It was nearly picked off! One more half-a-step and the linebacker intercepts and the Falcons get the ball at the 25! Atlanta’s defense has been on the field for more than 40-minutes. They’re clearly exhausted, they’re on their heels, they’ve got nothing left. Just run it up the middle and win the game. Just run the ball. They did that on second down. But because they attempted a pass on first down, they almost didn’t get the chance. Back to the Falcons choking away the game. Atlanta’s up by eight points and they’re at the New England 22-yard-line with 4:40 to play in the game. That’s a 39-yard field goal to go up two scores. If you run the ball straight up the gut three times in a row, then kick the points, you’re got an eleven-point lead with less than two minutes to play. The only thing you absolutely cannot do is go backwards 23 yards! So they lose one yard on the first run. And then they panic. Ryan attempts a pass and he’s trapped for a 13-yard sack. Then another pass play with a ten yard holding penalty. Then the punt. Then the loss. If they run the ball, they win the game. Instead, they tried passing. And they lost. They went for the mile when an inch would have won the championship. Like Pete Carroll and the Seahawks two years ago. Just run the ball and win the game. Knowing how to close out a game, how to milk the clock and kick a championship clinching field goal, should probably be added somewhere next year in the Falcons’ playbook.